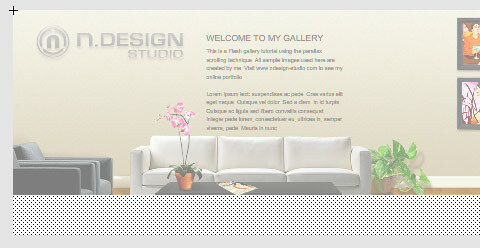 In this tutorial, you will learn how to make a Flash parallax scrolling gallery from scratch. Parallax scrolling is frequently used in most 2D animation and games, where the background images and foreground images scroll at different rate of speed. This will create an illusion of depth as the background images are moving slower than the foreground images. First we need to make a tiled wood floor image. 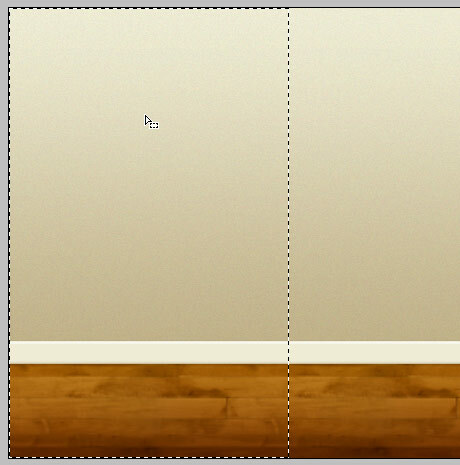 Here I use a 280 x 182px hardwood floor image. Go to menu Filter > Other > Offset and enter the following settings: Horizontal = 140, Vertical = 91 (half size of width and height), Wrap Around. Then use the Clone Stamp Tool to touch up the cutting edges. Select all and go to menu Edit > Define Pattern. Now make a new document, 2520 x 450px. Use the Rectangular Marquee Tool to make a selection. Fill it with a 2 color linear gradient: color1 = #eeebd4, color2 = #cabb99. 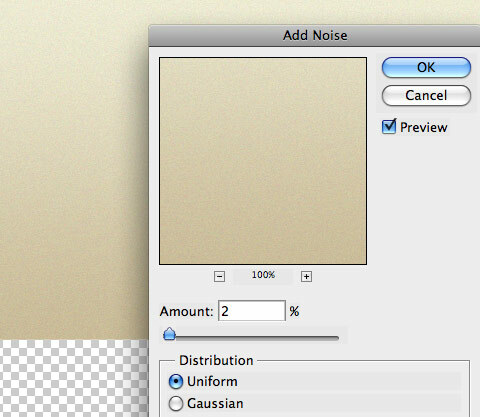 Then apply Filter > Noise > Add Noise = 2% to add some texture to the wall. Make a rectangle shape just below the wall. 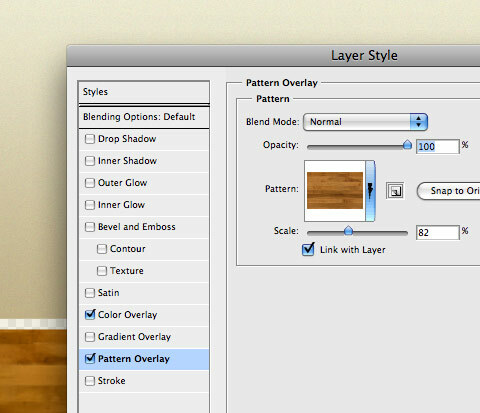 Double click on the layer to activate the Layer Style palette, apply Pattern Overlay with the wood pattern you created in Step 1. Select foreground color #f0ecd6 and make a rectangle shape above the floor layer. Double click on the layer to activate the Layer Style palette, apply Inner Bevel effect as shown (Size = 3, Angle =70, Altitude = 64, Shadow Color = # 856738, Shadow Opacity = 39%). Then, apply Drop Shadow (Opacity = 27%, Angle = 90, Distance = 1, Size = 3). Paste in your vector logo on the wall. To make the metallic effect on the logo, apply Gradient Overlay (Angle = 90, Gradient color1 = #a9a3a3, color2 = #a9a3a3, color3 = #d7cfcf). Then, apply Inner Bevel (Angle = -48, Altitude = 21, Shadow Opacity = 0). Finally, apply Drop Shadow (Shadow color = #73552d, Opacity = 25%, Angle = 90, Distance = 4, Size = 4). Now it is time to add in some furnitures in the scene. Be sure to find stock images that are in the front-view perspective that blend with the scene. 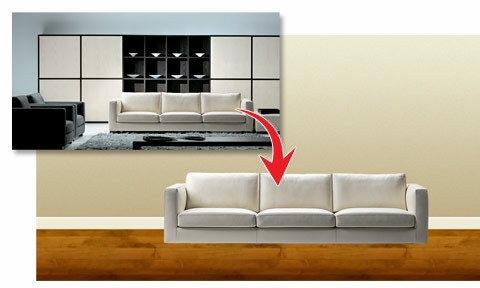 Cut out the background from the stock photo and paste the couch above the floor layer. Make a new layer. 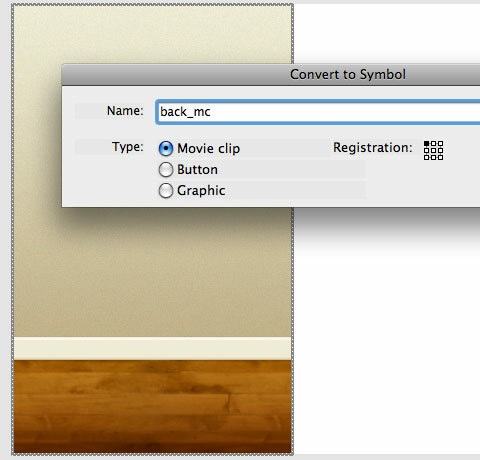 Hold down the Cmd key and click on the couch layer thumbnail to load the selection of the couch. Choose a muddy brown color and fill the selection with Foreground to Transparent gradient. Then apply Filter > Blur > Gaussian Blur = 3px. Go to Edit > Free Transform (Cmd + T). Hold down Cmd key and drag the top middle handle downward and toward the right to create a cast shadow. Now shift this shadow layer below the couch layer. Repeat this step to make the side couch. Make a new selection as shown with the Pen Tool. Then create a new layer and fill the selection with color #eef0ec. Next, fill the column with a gradient color that is a darker shade. Since these steps are very repetitive, I’m not going to further explain the details. Remember, the goal is to find items (stock photos) that are in the front-view perspective. So, be creative! The items I have included: Coffee Table, Plants, TV, Bookshelf, Toys, Books, Light Switch, Glass Table, Desk, Computer, Printer, Chairs, Clock.. Assuming that you have finished with the PSD, now it is time to export the graphics to re-assemble in Flash. First, export the tiled background image. 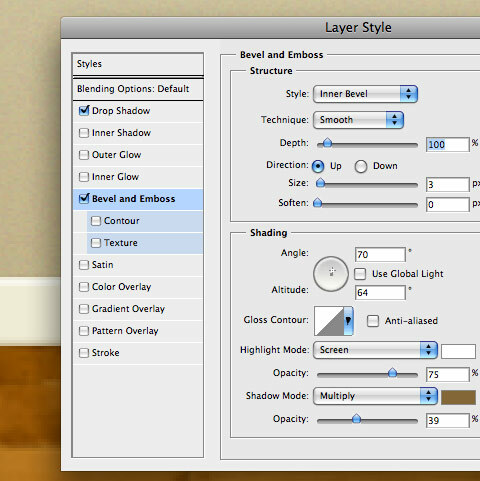 Hide all other layers except the wall and the floor layers. Make a selection 280 x 450px, go to Edit > Copy Merged (Ctrl+Shift+C). Then paste the clipboard in a new file and export the image to PNG. Now export the other items (furnitures, tables, desk, bookshelf, etc.) to individual PNG files. We will re-assemble these items into the scene in Flash. 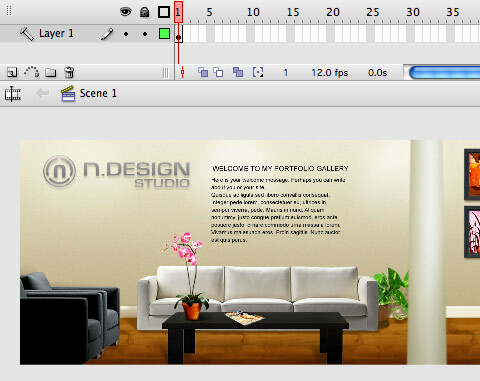 Create a new Flash document, 700 x 450px at 25fps. 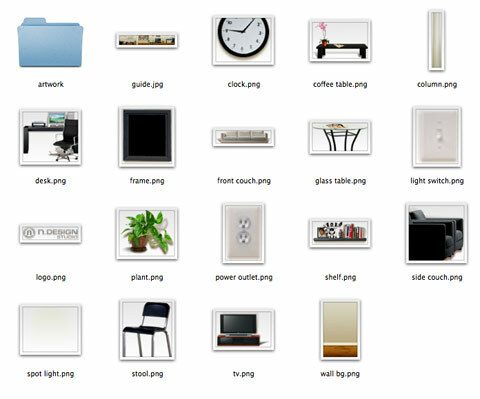 Import all the PNG files and organize them in a folder in the Library palette. Then import a JPG copy of the Photoshop mockup and set it to Guide layer. We will use this guide layer to assist on positioning the items on the stage. Drag the wall bg.png from the Library to the stage. With the wall bg.png instance selected, press F8 to convert it to movie clip symbol. Make sure you select Type = Movie clip, otherwise the ActionScript will not work. Name the instance "back_mc" so you can assign ActionScript to it. Double click on the back_mc instance to edit the movie clip. Hold down the Option (Alt) key and drag the wall bg.png to the right to duplicate it. Duplicate it 9 times until you reach 2520px in width. 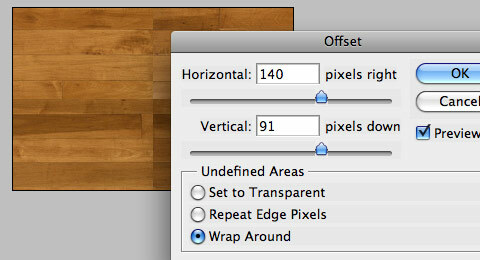 By tiling the background graphic rather than using a full image, you will minimize the file size. Now drag the other items from the Library and position them as shown on the guide mockup layer. Then use the Text Tool to display a welcome message. Go back to the main stage, make a new layer. Use the Rectangle Tool to make a 2520 x 80px box. With the box selected, adjust the Alpha to 0% to make it invisible. Press F8 to convert it to a movie clip and name the instance front_mc. Double click on the front_mc instance to edit it. Use the back_mc as the guide and position the column, table, and stool.png as shown on the mockup guide. Try to avoid placing any objects at 750px from the left and right side of the movie clip because the front_mc will scroll faster than the back_mc. Make a new layer above the front_mc layer. 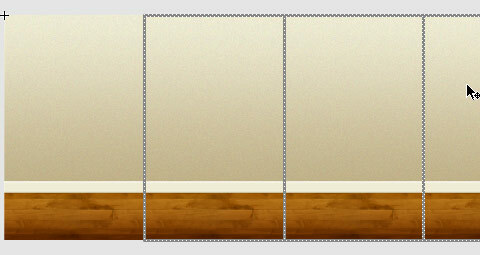 Use the Rectangle Tool and draw a 700 x 450px box on the stage. Fill it with black gradient: color1 = black (alpha=30%) and color2 = black (alpha=90%). Notice this will create a tinted effect on top of the movie clip. Press F8 to convert this to symbol and name it "tint symbol". Convert the "tint symbol" instance again to a movie clip and name it "tint". Double click on the "tint" MC to edit it. Create a fade-in motion tween in between frame5 and frame20. Then delete frame1. 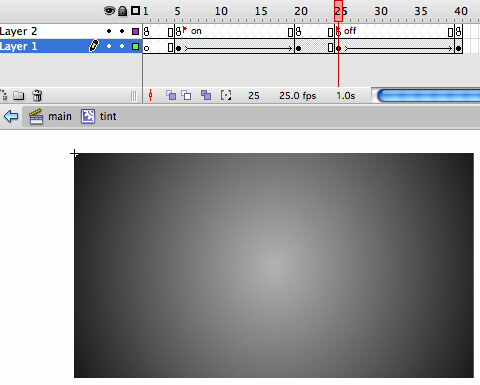 Reverse the previous step to create a fade-out effect of the tint symbol between frame25 and frame40. Then make a new layer for ActionScript. Insert stop() action in frame1 and frame20. The first 2 lines will create a fake button which will block all the buttons below the "tint" MC. The third line sets the lock_scroll variable to true. In the previous step, the variable was set to "lock_scroll = true" to stop the scroll function as soon it reaches frame5 (“on”). Now we need to set lock_scroll = false at frame40. Basically, the script tells the "tint" MC to play label “on” and load the external SWF in the movie container, "content_box". Repeat this step for the other buttons and load the SWF file accordingly. Make a new document, 310 x 265px. Design the layout as you desire (here I have some text and images on a rounded white shape). Save the file name according to the button actions you’ve assigned in the previous step. In the external SWF, don't forget to make a button that allows the user to close the pop-up and go back to the main movie. Create a button symbol and name the instance close_btn. In the action layer, enter the following code. When the close_btn is clicked, it will unload the movie in the "content_mc" container and tell "tint" mc to play label “off”. Now publish the final SWF file along with the external SWF files. You can view my demo or download the zip. Looks nice! But the front_mc should move faster than the back_mc for the parallax-effect to work. Picture yourself in a moving car, looking out at the landscape through the side window. The road will move really fast, while the clouds almost seem to stand still. It’s the same thing, only not as extreme. you are amazing, man… thanks for the tutorial! Great tutorial! I really enjoy your websites and make it a practice to visit them every day to see what is new. Wish I had your talent…………. Truly Impressive! Keep it up! This first poster is correct – this isn’t parallax scrolling. Maybe something is wrong with the demo? The background should be scrolling slower than the foreground. All I see is a picture scrolling across. Good work! Thanks for it. @dude: Yes there is a parallax scrolling. Watch for the pillar moving in front of the pictures. It’s just not a very big difference between the speed of foreground and background. Tough, there is a slight calculation error I think: The pillar is not in the same position when the picture moves to the right and when the picture moves to the left. But anyway: Nice! Is this not the exact same tutorial you did for web designer magazine ages ago… digging up old content eh ? I wish I had flash cuz thats cool. Very great tut! Thanks a lot and keep it up! Hell, this is amazing. Thank you for sharing! @andy: Yes, there is sort of a parallax-effect, but it’s inverted. For a more realistic effect (as I wrote before), the front_mc should move faster, not slower than the back_mc. great tutorial. What I would like to see if the explanation for the code, that would help people like me that want to learn actionscripting. Love your site.. but wasn’t this the same tut in a web design magazine about a year ago? your tutorials are very detail and awesome man.. thats help me a lot..keep up the good work nick..
@John – Yes, it was previously published in Web Designer magazine before. I re-publish here due to many requests. Umm… this isn’t right. The background is moving faster than the foreground, this is reverse of how it should be. Thanx for this fantastic tutorial and of course the inspiration. Uh… where’s the parallax? I viewed the demo and I see the room move from left to right, but the foreground and the background seemed to move at exactly the same speed – no parallax. An excellent tutorial. Good job! @Nick. Cool Thanks. You rock. I have the same issue as #36, same speed. I’m using Firefox 2.0.
thanks, because with your help we are getting a more friendly internet every day; really thanks for all you do for web master rookies. Great demo! You’re giving designers some top quality training for nothing. And explaining everything step by step means that we can all give it a try. is there a way to blur the wholoe swf while scolling? I think it might be a little easier on the eye. This is mad cool. Thanks for all of your hard work. I can’t wait to give it a try after my final exams. Great element and thanks for share your hard work. I challenge you to this… traducelo al español. This gallery is very cool …But the link is corrupted…Could you put another archive ? THAT’S JUST FANTASTIC! I love your site! Nice demo… but it took me a few moments to realise what wasn’t right about the perspective. When you move around in real life, objects closer to you appear to move faster than objects further away. In your demo, objects closer to you move SLOWER than objects further away. hi! this is awsome, i was lookin for this 2 weeks ago, just a question: is so important to made 9 backgrounds?? i need to know this ’cause i have a background that is not a pattern, have diferent forms, etc, so this affect something?? Excelente, nice work, very interesting . Once again you prove why this is the essential web design blog. Brilliant tutorial, many thanks! @pakolg – the demo FLA files were saved as Flash CS3 format (thus you need CS3 to open it). Please download the zip again, I have replaced the files with Flash 8 format. Things closer to you should be moving faster than things away. it looks nice but i didn’t have found out how i can stop the scrolling once i’ve start it?!? Hola!! disculpen la ignorancia, pero el primer diseño es hecho en photoshop verdad?? Por otra parte los quiero felicitar porque me encanta el diseño de su pagina. Thanks for this brilliant post. Well I have tried it with the instructions provided here, and its looking pretty good. Excellent tutorial! I never got flash … now I’m beginning to see that it’s not that big of a deal, if you know what you want and no how to obtain it :-). Thanks a lot. Keep up the good work. we did something similar for a client recently. This article has been ripped straight out of Web Designer Magazine? Shouldn’t you be worrying about publishing copyright issues unless you have permission to redistribute their material on your blog?. Sure copying out of publications is an easy way to get content and visitors but it’s also just as easy to get yourself sued, very disappointing behavior from what is otherwise a pretty good blog. Thank you for sharing this.I like you design very much! Nice tutorial on site. I am learning Flash CS3 and sometimes working Flash scripting for a few jobs. I truly enjoyed exploring your work and I would like to thank you for sharing such an immense talent. Thanks a lot man for sharing this tutorial with us :) Although I find the scrolling a tad bit of a headache. Something I can keep in mind next time if i just wanted to make something look cool. Steven: I don’t think it’s a rip off, especially if you were to look at the number of tuts on the web that almost look the same. Would like to know a couple of things. 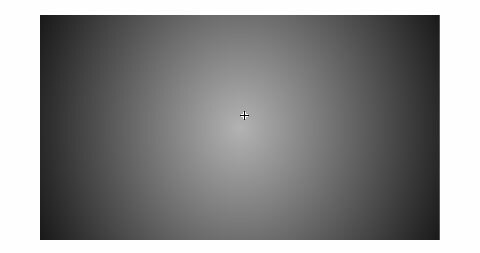 Is it possible to make your swf files open at a pre defined (x & y) position rather than at the center. Would xml driven swf files open up on the tint mc? The reason I asked was I have heard of ‘layer’ clash in flash. Maybe is because NICK write for that magazine?, inform yourslef before posting a negative comment. Hey Steven, it’s good idea to advertise your magazine here and it’s smart idea that you did here… But I will not click on your link. Nice trying. But not right. Thanks for a well-written and easy to follow tutorial. by the way- love this site’s design. Amazing! hi, thx for great tutorial !!! and, another problem, i have only flash mx/ flash 6, is that action sript works with my old version of flash ? could you post .fla file in this old format ? Awesome, really cool flash gallery! awesome. But I think there is one problem when you wanna stop inside it vibrates but no stop. Nice Gallery, I was using differnt way for our flash work. This is really helpful for my future flash work. This crashed my browser (FF3) when I right clicked it. Generally it was quite slow and buggy, only scrolled if the mouse was in a very specific location. Pity because it looks great. Yet another brilliant aid from webdesignerwall. i’m currently learning Flash at Tech in sydney Australia. It would really help if you could send me Actionscript comments on what all the code is doing. I learn faster when i understand what the code is for. Seeing other peoples script comments helps me alot. Are you able to send me(if you have time) a text file with the actionscript for the above tutorial, but with script comments? it would me alot!!! woops, i meant “it would help me alot” . . . . . So many components to purchase for Flash MX – CS3, but a black hole of information on how to create you own simple component. Have you seen or posted such a tutorial? Very nice gallery, great job! This is awesome. I’ve never seen such a beautiful flash gallery in my life. This is so realistic and full of life flash gallery. Hey I used my own version of Parallax scrolling, but this is an excellent tutorial, I’ll definitely let people know about it. My site is using parallax scrolling – http://www.skribbs.com – check it out let me know what you think! The tutorial is very helpful, so thanks for that. NOW… is there a way to make the scrolling effect go smoothly? Even in the demo, it looks rough. aside from that. Awesome site! I have been scouring the internet for a UNIQUE flash gallery for a projeect of Kids art here at work. Fom the example I will be jazzing it up with a kids theme. Thanks alot. Great!!! Very very impressive thank you for the script. Maybe I can tweak it to something relevant to my project. 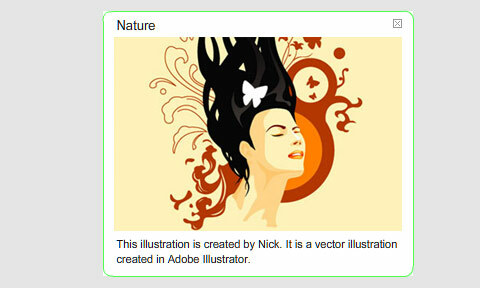 Prefect site for designers…Cool Gallery for flash experts. I want to make like this one.. nice thank you so much for the tutorial.. nice job..
Wow! I’ve been looking for help on creating a similar effect. I’ve got a new client who wants a layered look and I appreciate this in-depth tutorial. You rock, man!! I wanted to add this example to the list. This is the one my client brought to me. I think it’s an amazing piece of work and can only hope to create something like this someday! Thank you its great work. How is done transparent buttons? Love your site, and all your tutorials are really really incredible!! “speed 1” must be lower than “speed 2”, considering that speed 1 moves the farthest objects, and speed 2 moves the closest. Try the optical illusion with your monitor and the farther wall on your room, move from one side to another. The monitor will “move” faster while the wall moves just a little. I downloaded the files, and it seems to be much better with speed1=18; speed2=22; or something like that. Thank you for the share of your knowledge in flash in this lesson. I has need very much to know how to make an application like that. what about if you have 3 different planes instead of two? Should I change/add ActionScript if I’d like the Gallery to zoom in on certain pictures? but i was wondering if maybe you could do a video version of it. it always seems so much easier to see things being done live and copy them or adapt them. Oops – parralax is backwards in your demo. Nearer things should move faster than farther things…. think of a car trip – the fence at the side of the road zips by, but the distant mountans hardly move. wow. is that how is it done? interesting. awesome! can be the tutorial made on actionscrp 3? its grat thank for the work! really cool and really easy to follow – you surely rule! thank you and best wishes! Brilliantly done and explained ……. Nice tutorial, as usual. I hated Flash when I first started using it, but now i love and appreciate it. I can’t wait to try this! I can not figure out how does Flash understand where is a middle point to scroll left or right! In my case in is far at the right side and I have to move a mouse right at the border of my flash video to scroll it left! How can I make program to understand my middle point is in the middle? I cannot wait to give this a try! I’m super excited about this!!! Great job! Is there an AS3 version aanywhere out there? The gallery is awesome bu I’m working in as3. Muchas Gracias amigo. Excelente Tutorial. Muchas gracias me encantó el tutorial, además q me encanta este tu blog muy lindo diseño, lo hiciste tu?? This is exactly the type of tutorial that should be on every inspirational web design web site. I love that you gone and explained how to use the Flash part. You are brilliant! It is super, but I really need the ac3 one. Does anyone know how to do it!? Thank you! Thank you! I was thinking in to do something like this to my new site, but only a desktop clickable :) This tuto helped me so much. 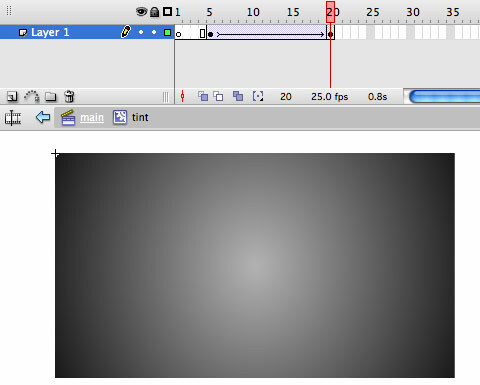 i’m having trouble doing this using CS4 seeing as how the motion tween is different. can anyone help me? can anyone help me do this with Flash CS4? Willie…did you get help with that? I’m on step 20 and can’t figure out how to adjust the alpha in CS4. It keeps adjusting the alpha for each color of the gradient fill. And…can anyone help me with step 16? Was I only supposed to copy the column to the to the front MC? Why does the white rectangle look like two in the preview under 16? no one has helped me yet. :( I’ve tried this multiple times…i can’t get it to work…when i publish to html it shows only the 450X700 box with that much of my room and it flashes the grey gradient off and on. i can’t get it to scroll when i move the mouse to the right. Actually, I’m still using AS.2 so i don’t think i could apply this. I love tutorial but for now, i dont have time to do self-study due to busy works..
hey man! in the file, the wall btns don`t load the external swf. In demo does but zip doesn`t. Can you tell me what`s up? Shouldn’t the AS for the fake button be logically in frame 20 where tint stops? Why the code still works beats me, Flash is weird :) and so is all Adobe suite even at CS4. At frame 20 shouldn’t the code in frame5 be no longer relevant? I named each of the instances in the tweens separately (tint_mc1..tint_mc4) to understand Flash behavior. Note if I only name the first instance tint_mc (frame5 begin of tween) Flash assumes the remaining instances (unanmed) are the same and targeted by the code in frame5. Why? my understanding was at a new keyframe in action layer or tint layer I am dealing with totally unique items. Why would code in frame5 at frame20 still apply? I love tutorial but for now, i dont have time to do self-study due to busy works..
I’m very anxious to find a way of doing this with AS3. I saw some other people here were also asking. Anyone get it it working yet? Thanks. Great tutorial! thank u very much for sharing this lesson with us ..
maybe this posting could be off topic but anyways, Having been surfing about your site I must comment on how it is well presented and professional. It is obvious that you know your topic and you are passionate about it. I am putting up a new website and I am trying to make it look fine, as well as pass on the best message. I have gained much from your site and also I look forward to your future posts. Please include the email that I have submitted into your mailing list and let us know when you make new posts. Thanks. The demo looks so great. Hope its not that difficult to create. Explained details. Simplify up then I will try to do more. A really nice tutorial very usefull. I haven’t tried the plug yet but it looks very nice! I can think of a few sites I can use something like this on. 1st Thks for this tutorial..
Great tutorial! u are awesome..thanks! im going to try it right now looks easy ! Was looking over web for this example. Now i can learn and apply it on my own projects. Happened to find and log on, excellent and great to see this gallery. I’m trying to design an E-book for my friend who is a unique calligrapher in China. Thanks for the inspiration. The Parallax Gallery is one of the most unique and innovative galleries!!! I have a question for you and I cannot seem to find the answer anywhere on the internet. I’ve setup something similar to your example, except that I’d like to have 1 of my movieclips loop. I know how to make a MC loop on it’s own, but I’m not sure how to loop a MC that’s moving forward and backward depending on how the mouse moves. Can you give me some insight as to how to code that clip? I’m thinking I somehow need to duplicate the MC? Hey very nice Tutorial!! Thank u a lot!!! I was trying to change the size of the windows and i couldn´t make it. must be 310 x 265px the size?? where i can make that change? This is an amazingly useful way to engage users! I’m targeting a small business and non-profit organization market, a group that responds very favorably to a one-on-one engagement with me. I’ve been looking for a way to lend that feeling in some way to my site. This will be a great big help! Simply Awesome!! thanks for sharing such a detailed and easy tutorial. That’s not correct. The pillar is moving at the same speed. It’s nice scrolling but not parallax. I don’t see any parallax scrolling. Hmm, what’s wrong? Great tutorial. Thanks for giving us. Still wonder white iphone 4 avaiable or not? We tells you the answer is "yes". Now you can buy the hottest white iphone 4 Conversion Kit and make a change! Still wonder white iphone 4 avaiable or not? We tells you the answer is “yes”. Now you can buy the hottest white iphone 4 Conversion Kit and make a change! Hide the header search form? Yes, I’d like to hide the header search form. This is really cool. Thank you for sharing this tut. The way web search form is hide is nice. I m a Web Designer in London & yes nice compilation and thanks for that hard work. Çok hoş ama bu kadarı beni aşar..
#Web Designer in South Africa. How it’s Very Helpful and AMAZING !! Hi – nice scene – how would you introduce some ‘easing’ into it, so the scrolling slows down as you get to each side? Paintingasder on the tablet is fun, but to do cool things need work.